For details of some local people who build wicking beds or raised garden beds, see the local resources page. The purpose of a wicking bed is to substantially reduce the number of times that the bed needs watering. They are particularly suitable for community planter boxes which are often not close to taps and are therefore not easily irrigated. Wicking beds have a waterproof lining that holds a large reservoir of water at the bottom. The water is drawn upwards like a wick via osmosis and thus becomes available to the plants. Basically it works like a self-watering pot. 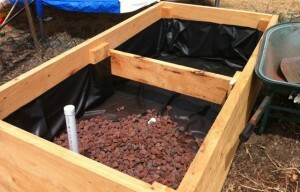 See Yummy Garden’s page for a local take on the advantages and disadvantages of wicking beds. The Urban Food Garden website. The big graphic above was obtained from the same website. See the resources page for a list of local people who make wicking beds professionally and whose services you might therefore be interested in. In March 2017, Pam Jenkins, member of Local Food Connect, gave a presentation on wicking beds. Here are her notes. Bed with a reservoir below and a wicking mechanism to enable water to permeate up. Reservoir medium: scoria, polystyrene, open structure. A barrier to prevent soil from clogging up the gaps- geotex. A waterproof membrane to contain everything. A drain at the level of the top of the reservoir. Inlet pipe with slotted drain attached to fill the reservoir. Why use a wicking bed? Poor or insufficient soil to support plants. 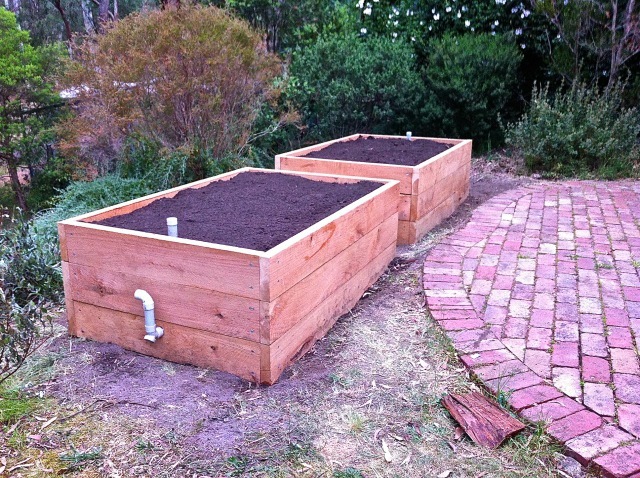 Usually a raised bed so less bending. Less frequent watering – none lost to surrounding plants or just leaching away. Water from below – less evaporation. Less spread of fungal disease caused by overhead watering. Able to heavily crop a smaller space. Essentially they are large pots. No water from surrounding soil. Possibility of disease in reservoir. If inlet not covered, can be a breeding ground for mosquitos. Completely dependent upon your inputs. Protective material over waterproof membrane. Install pipe with lid for filling reservoir. Water permeable membrane – shade cloth or geotex. Drain hole level- use proper fittings and silicon in. High quality soil, compost, large amount of organic matter. Suitable plants – depth of soil. Care of seeds and seedlings. Water from top until roots long enough to capture water from below. Watering: check the reservoir. When the water looks low, top it up. If it has been allowed to dry right out you may need to water from the surface as well. Hot winds. Feeding: use half strength liquid fertilisers and half recommended amount of slow release pelletized fertilisers. Keep adding compost and well composted manure with each successive planting to maintain sufficient organic material to ensure that the wicking system works. Soil cover not thick enough – over-watering. Re-purposed planter box gives way. Over fertilising / under fertilising. Not enough fibre in soil to promote wicking. Usual garden problems: snails, possums. Hi, we have just established some Wicking Beds in a community garden. I wondered if you would allow me to use some of your words and your great little picture on our sign to explain what a Wicking Bed is. The sign will be installed at the Community Garden which is in the CBD of Albury. Thanks for your comment. Yes, feel free to use any of the words that you wish. If by “great little picture”, you mean the diagram then that comes from The Urban Food Garden website so you would either have to ask them or, like us, just use it with attribution.